Booking for sailing on Rhumbline can be done directly through Martina. Sign up here for the clinic. Choose "club deposit - $25" to reserve your spot. To keep cost down, bring the remainder in cash to the clinic. If you want to make a full payment online it will be $52. 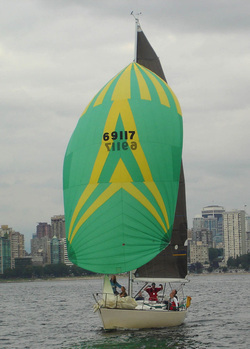 Book Rhumbline with an instructor for an afternoon of sail practice. Best days are Monday, Friday, Saturday & Sunday afternoons. At $210/day for boat and instructor this provides fantastic value for members of the WCSC considering that commercial rates for boat & instructor run anywhere from $590 to $890/day. On top of that you get to sail with a very accomplished and well known race skipper.